There is something to be said for the convenience of staying at a resort with the course on property - no driving, unloading and re-loading clubs, etc. - just step out of your door, jump on a cart and tee off. The practice green is located near the center of the resort, which means one can venture out for some putting and chipping practice at any time during the day. Beginning in August of 2004, the resort will also offer a complete driving range, which will be located at the far end of the property. The pro shop is small but efficient, and is stocked with golf accessories and attire. Downstairs from the pro shop is a fitness center that includes elliptical trainers and some of the latest in workout equipment, with two televisions mounted above the cardiovascular areas. There also are men's and women's locker rooms with saunas and showers. 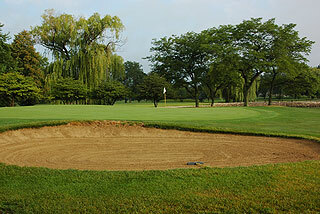 The golf course offers a nice resort experience, and one that can be enjoyed by all levels of players. Although short (6307 from the tips), this 3 star (Golf Digest Places to Play) layout features some tight fairway, numerous water hazards and just enough bunkering to elicit your "A" game. Beginners will appreciate the wide openings in the front of many of the greens, which are oversized but mostly flat and easy to score on. Bump and run chips and approaches can be utilized often here. The terrain is quite flat, providing level lies on nearly every shot, with the exception of a few raised green complexes. Throughout, golfers will be pleased with the conditioning from tee to green, as some good work has been put in by the course superintendent and the landscaping crew. The Blue tees play to a 123 slope, while the whites measure 5967 yards with a slope of 120. The ladies will also find a slope of 120 from the forward tees, which measure a reasonable 5109 yards. On course color coded stakes are visible on both sides of the fairways, making it convenient to ascertain the yardage to the center of the green. Color coded flags also indicate the day's hole locations. Two of the first three holes at Pheasant Run are challenging par fives. The opening hole is a tree lined par five that doglegs to the right past the 200 yard marker. The left center is the place to be off the tee, and a lay up is necessary on the second shot, prior to the water hazard that crosses the fairway near the 65 yard area. The par 3 second plays long, but there is plenty of room for entry from the left side of the putting complex. 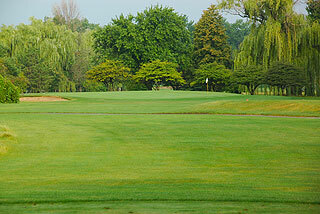 Number three is extremely tight, with out of bounds to the left and a thick row of trees to the right. There also is a water hazard along the right from 200 yards in. There is a bunker to the left and trees fronting a water hazard along the right on the 217 yard par three 4th. This precedes a stretch of holes that is perhaps the easiest on the course. A lay up tot eh 100 yard area right of center will take the greenside sand trap out of play on the short par four 5th. The sixth is a pretty par three over water, with plenty of room greenside. A drive landing anywhere on the tight tree lined fairway on seven will leave a simple approach and a good scoring opportunity. The 8th is ranked as the 17th handicap - a 319 yard par four that can be reached off the tee by long hitters. A lay up towards the 100 yard area will leave an easy approach and a safer play, as the greenside bunkers deserve some consideration. The back side is a bit longer, and features back to back par fours that measure 430 and 468 from the blue tees. Number ten doglegs to the left with a sand bunker taking up residence in the center of the fairway past the 150 stake. Two choices here - drive over the trap or lay up and play a mid iron on the approach. 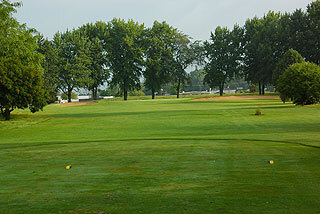 Eleven is tree lined and tight par five and is followed by short par three that is a mandatory par and hopeful birdie. 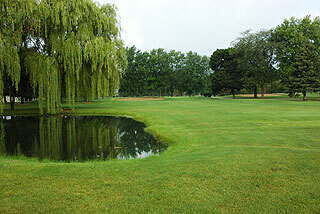 Number thirteen invites a tee shot placed left of center, as pond is situated to the right about 115 out. The monster par fours follow, with the first playing 430 yards along a very narrow tree lined fairway. A grip and rip it mentality is needed to reach in two, and there is ample room near the green. The 15th is even tougher to reach in regulation, as this par four measures 468 from the blues and 449 from the whites. The area in front of and around the green is very flat however, providing an ample opportunity for a bump and run and possible par save. The sand trap in the right center of the fairway is about 280 yards from the green, and poses a serious obstacle to par on the narrow tree lined par five 16th . Negotiate the bunker while staying on the fairway and the approach is simple. The par three 17th is very long (227 from the blues and 219 from the whites) but there is plenty of room for error greenside. 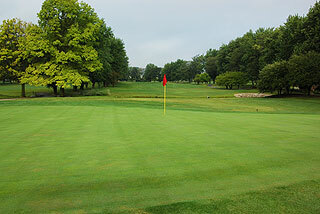 The fairway on 18 is tree lined but generous, and leads to one of the only raised green complexes on the course. Pheasant Run is not a long course - but with the challenging par fives (three are ranked as the # 1, 4 and 7 handicaps) and some long par threes (200, 217 And 227 yards), it sure seems longer. The consistent characteristic is that once you land on the green, you should be able to put it in the hole on these well conditioned and level putting surfaces. 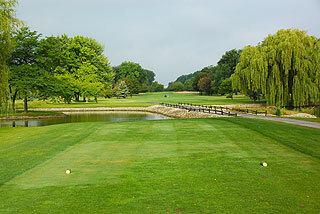 For more info, visit our page for Pheasant Run on our Chicago Golf Course listing section - click here.